As a background, I will first give a brief description of the astrological chart that I use for England (and, by default, the UK) - the crowning of William the Conqueror at Midday on 25th December 1066 (I shall expand on my reasons for using this particular chart later). Countries have horoscopes that can be interpreted just the same as one would for a person. 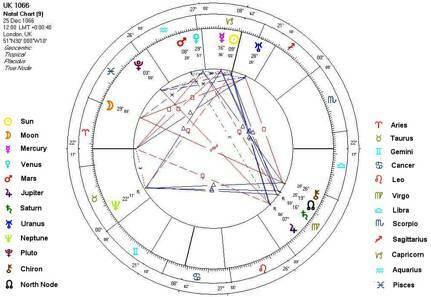 In fact, a chart can be cast for anything that has a ‘birth’, and it will embody the qualities of that moment in time. As the planets continue on their cycles through the heavens, they form new aspects (astrologically meaningful positions) to the planets on the birth chart, and it is through the transits between them that astrologers glean clues and indications as to the type of energy that is around and the possible events that can then manifest as a result. Astrology is therefore a very powerful tool, as the ancients knew only too well. 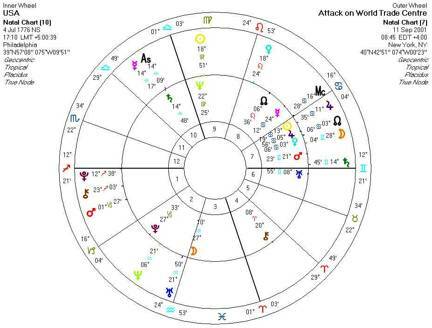 I cannot say that the transits of the planets actually cause things here on earth, but statistical analysis shows there is a clear correlation of transits with types of events and there is certainly something strangely synchronistic that happens. As the old saying goes: ‘As above, so below’. 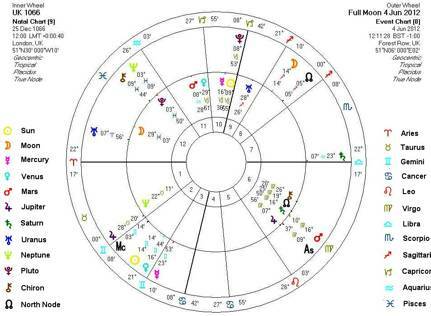 At this moment of 11:11 on 21st December 2012, the Sun will have just entered Capricorn and the tenth house and this, I feel, is particularly significant. Capricorn is the last of the earth signs, and if we think of the evolution through the signs, arrival here is when we should have reached the greatest understanding of this earthly plane and physical reality. In Geoff Stray’s book, Beyond 2012, he writes extensively about the possible spiritual and esoteric changes that could take place at this time, so if there is one astrological sign in which to have an actual manifestation of an event, it would be very fitting for it to take place in Capricorn. It is entirely appropriate, for instance, that – symbolically (i.e. given the date we choose to celebrate it) - Jesus was born under this sign. This speaks to me of the actual physical incarnation of the godhead. It is worth contemplating the meaning of the glyph for Capricorn, a creature half-goat, half-fish, as the coming together of spirit and matter. Uranus, the planet which rules Aquarius, is the idealistic sky god, always trying to create the Utopian dream – the perfect system that exists on a mind level – and if that means shattering the status quo to obtain it, it will do so whatever the cost. He wants the perfect Universe, with all things equal - but his actions are often unpredictable, unconventional and shocking. Currently, airy Uranus is transiting through the watery sign of Pisces and this ordered god is, I think, struggling with the Piscean lack of clear-cut boundaries, facts and a logical systems. Uranus constantly seeks answers through the clear intellect of the mind, and emotional Pisces rules mystery and illusion. It is a bit like driving a car along in thick fog – if we put on the full beam (Uranian light) in the hope of seeing better, we find it makes things even more unclear! We can see it everywhere at the moment, especially in the conspiracy theory world, which has mushroomed all the while Uranus has been in Pisces. The urge is so strong in us under this transit to try and seek that ‘Uranian truth’ that we are sure must be there, but I doubt that is entirely possible in this current Piscean world of smoke and mirrors, with its propensity for deception and lies, fantasy and self-delusion. [This aspect is made doubly strong, as Neptune (the planet which rules the sign of Pisces) is in Aquarius (the sign normally ruled by Uranus) - a phenomenon known as Mutual Reception. Neptune has been in Aquarius since 1998 and enters Pisces in 2011] When Uranus moves out of Pisces into Aries in 2010, the fog will lift and there will be much more clarity and action. In 2012, Uranus and Pluto are going to come into their first really challenging aspect to each other since the 1960s and this will create a build up of an incredible pressure - of volcanic proportions. The tension between the two forces could detonate revolution and rebellion (even earthquakes, on a physical level), and could bring crashing down what we thought were established political structures. This will be especially so, because Uranus will be in the war-like sign of Aries, and Pluto will be in Capricorn, which represents authority, the establishment, political structures and governments. 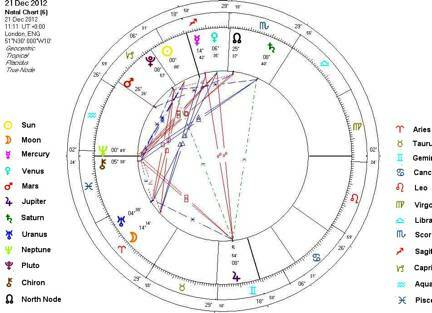 From this combination, I notice - with some trepidation – that Pluto is, extremely significantly, exactly on England’s Midheaven and Sun, while also squaring Uranus in the twelfth house of the collective. So all that energy for revolutionary change will be focusing on our national identity in the world. 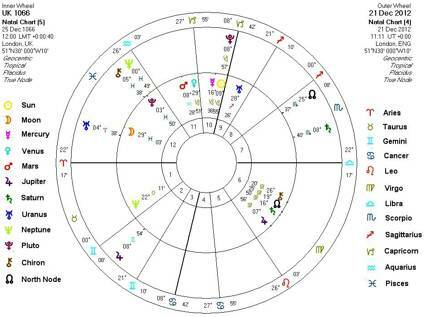 The twelfth house is also about hidden enemies and the ‘rebel’ could well emerge suddenly from quite an unexpected source to rise up against Pluto’s power and control, with very serious consequences indeed. The whole religious issue, which has effectively dominated global politics and the ‘War on Terror’ for the last decade, is also not going to go away overnight and may well escalate to an Armageddon-type situation. When planets transit through Sagittarius, as Pluto has been doing, it tends to be in the realm of philosophical thought and the potential of something - it is only when it enters the sign of Capricorn that those ideas are then materialised. There is currently quite a bit in the media about believers in ‘End Times’, highlighting how an awful lot of people are trying their hardest to make this rather frightening day-of-judgment scenario a reality. We can use Pluto’s potency for powerful transformation and to change ourselves for the better, or we can choose to only see the ‘bad’ in others and demonise them. America wants us to believe it is the ‘Land of the Free’ - democratic and fair - and that all the opposite traits reside in the enemy ‘out there’. Sadly, we can only use our imaginations to picture a different and more consciousness-raising scenario than the one that actually did occur in the wake of 9/11, perhaps one with America taking a brutal look at its own foreign policy, seeing where there could be fundamental changes made for the good of the world, and implementing them. This is perhaps a naïve hope, considering where we are in reality in the evolution of consciousness. Sometimes, therefore, maybe we do unfortunately have to suffer catastrophic and painful events as a wake-up call and to force the creation of a new consciousness. Sometimes in our own personal lives we experience challenging crises, but it is those who do not take the stance of being just an innocent victim and instead look at the situation as an opportunity for self-awareness and growth through examining their own part that are the ones who become more enlightened, wiser and mature. However, many people do believe we could get a helping hand in this regard. The Sun will be exactly positioned at ‘Galactic Centre’ in 2012 and some believe we will then be more open to the energies of pulsing galactic super-waves (see other articles on the Diagnosis 2012 website, and in Geoff Stray’s Beyond 2012). This may activate our pineal gland, which could, in turn, raise our vibrational frequencies to much higher levels - and possibly take us into new dimensions altogether. This would suggest to me that we have to accept we live in an imperfect world and that the Uranian vision of perfection, as seen through the cool unfeeling eyes of masculine logic, has to be balanced by Gaia’s earth wisdom - otherwise the darker side of the feminine will rise up and brutally retaliate. It is interesting to me that it is Venus who is the end product of this story, insinuating that it is indeed love that offers the resolution in the end. It is worth noting how there could be dire consequences by neglecting the feminine archetype in all our hopes and fears for what 2012 might bring, and both men and women would do well to heed this. It is said that there were only two things the gods required from mankind - and these are inscribed above the temple at Delphi. The first is ‘Man know thyself’, and the second is ‘Nothing in excess’. I leave it to you to contemplate how well you think we have fared in this regard since those ancient times!